Today we have two subjects at hand, and both involve strange manipulations of grain. 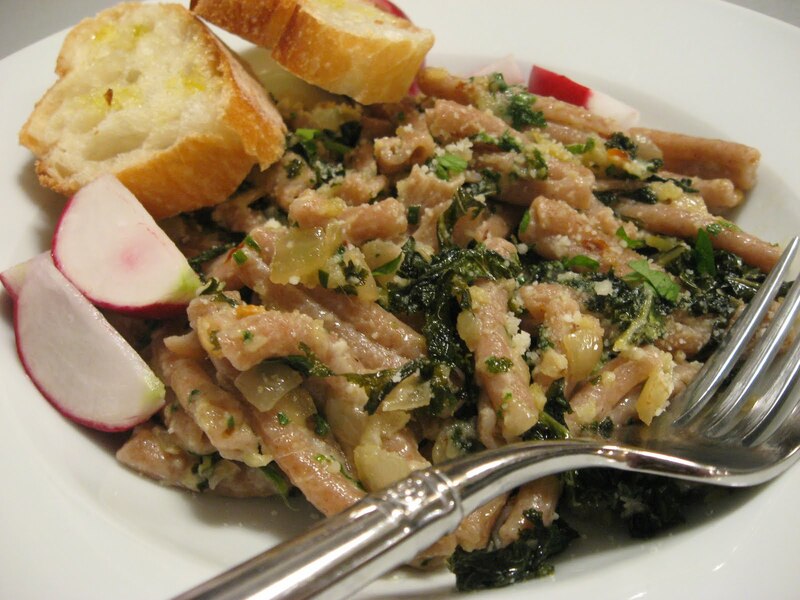 The first is a product we have come to admire: pasta made from farro by Rustichella d'Abruzzo. Farro is a grain more commonly known as spelt, and one commonly used in Italy. In this case we used their casareccia, which is somewhat like a penne that has been sliced lengthwise and twisted a bit. 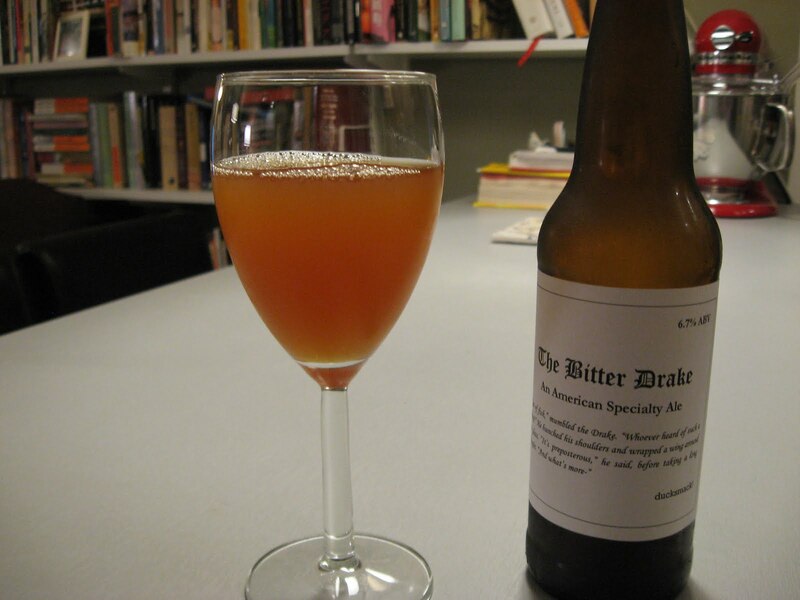 The second subject today is a tasting of The Bitter Drake, the Belgian-style ale brewed two months ago that (hopefully) is rounding into shape in time for summer. More on that later. Our interest in the farro pasta stemmed from a desire to try slightly healthier versions of pasta. We began with whole wheat spaghetti from De Cecco, and really it is a good substitute, particularly where a slightly nuttier flavor is welcome. But ultimately we've settled on the farro, because the flavor is a bit subtler. Reeling a bit from all the porky (hello, Fatty Crab), ducky (hello, er...Fatty Crab), and beefy (hello, Shake Shack) delights in our neighborhood, we set out to make a somewhat lighter dish. Here's how it worked out. Part of our balanced diet. Now, this dish was healthi-er, but we wouldn't want it to be too healthy, and that's why there was also a healthy dose of olive oil, butter, and a bunch of parmigiano reggiano. 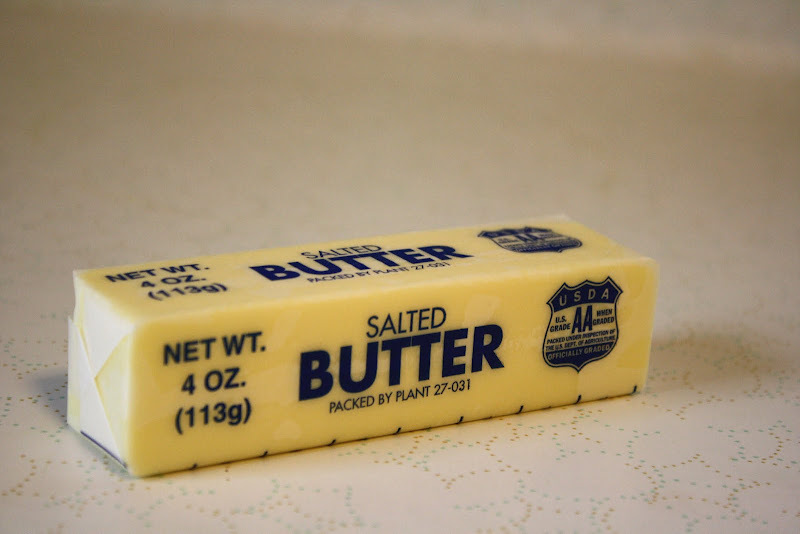 The ingredients by themselves are somewhat dry, but there is a magical combination of oil, butter, cheese, and a little pasta cooking water that gives this dish a creaminess you might not expect. With all these powerful flavors, it's fairly important to keep track of the amount of salt you're using, since the cheese, anchovies, and capers are all salty as well. It's mostly about finding the balance between all these crazy flavors. When the dish is finally put together, there is a winning symbiosis between the nuttiness of the farro and the pine nuts, the creaminess of the cheese, the sweetness of the onions and raisins, the tartness of the capers, the spice of the chilies, and that slight meaty undertone from the anchovies and garlic. We've tried making variations on this dish before, but this is perhaps our finest effort to date. 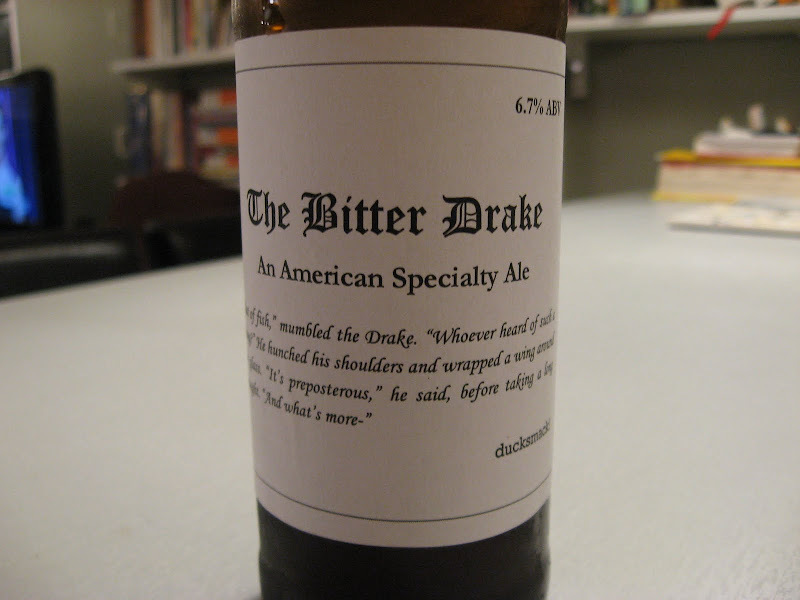 Now that Belgian-style ale, The Bitter Drake, is another story. Brewed in early April and bottled in early May, this was my first attempt at brewing from my own recipe, using a technique called brew-in-a-bag, or BIAB. This is an Australian method for brewing with one fewer step than is traditional, and one fewer vessel. The basic premise is that you use a mesh bag to hold all the grain as it steeps, and then simply pull the bag out when it's ready to boil. Simple. For small-scale apartment brewing, it's pretty ideal. I'm calling this an American Specialty Ale, which is just vague enough to be correct, despite it being fairly similar to a Belgian saison. 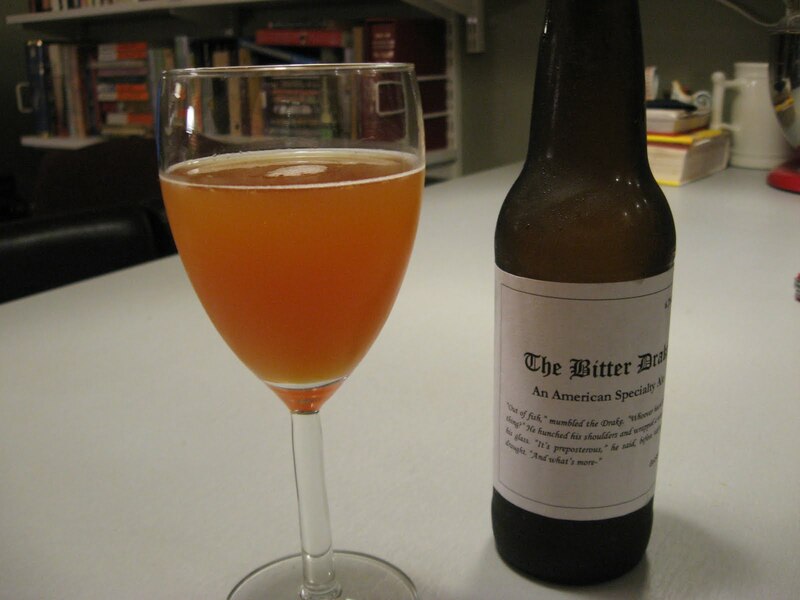 The recipe uses Belgian pilsner malt with minor additions of two specialty malts to add to the body of the beer, and then one hop, Hallertau, used only for bittering purposes (most Belgian beers tend to emphasize yeast flavors over hop flavors. For shorthand, you can think of Belgian beers as yeasty, American beers as hoppy, and British beers as malty, though of course this is not always the case.) Everything went swimmingly during the brew day, and I hit all my estimated temperatures and specific gravities and other things casual readers here really aren't likely to care about. Suffice it to say things went well. The biggest experiment of the batch was that I opted to try a dry yeast, Safbrew T-58, and allow it to ferment at the ungodly ambient temperature of our apartment. With most yeasts this would be a terrible idea, but I wanted to see how this one, which is meant to work at higher temperatures, might turn out. The dry yeast used for the Everyday IPA last batch worked very well, though I kept the temperature about ten degrees cooler for that one by partially submerging the fermenter in water. Higher temperatures are usually used to intentionally bring out subtle flavors of esters and phenols such as you might taste in a Belgian Saison. So how would this one turn out at a higher temperature? Well, after two weeks in the bottle, on May 18th, it was pretty icky. And not carbonated yet. It had a strong apple flavor that I believe was due to it being too "green" or young. So I left the other bottles to condition for another week and a half, and today we're testing the new one to see if it's ready to take on our Memorial Day vacation. Not so outwardly different. So what's the verdict on the taste? Not ready yet. Pretty good, but still needs more time. The carbonation is nearly there, but not quite, and there is still a subtle apple cider quality. But overall, I'm happy with the taste of this, it definitely has that Belgian yeast quality, and in another week it might be right on. Unfortunately, we'll have to drink something else over the long weekend. Life is hard sometimes.